The 50-year-old chef believes in being as creative a parent as he is a cook. He and his wife, Susi, have a blast with sons Benno, 14, and Leo, 12, in and out of their New York City kitchen. Q. How long have you been passionate about food? A. Since birth! Everyone in my family cooked—my parents, aunts, uncles, even my cousins. We hunted our own meat, cured our own olives, pickled our own vegetables, made our own pasta. Our idea of a rainy-day activity was making 200 pounds of sausage! Cooking was always an expression of love. Q. You partnered with Barilla on its Share the Table campaign [sharethetable.com], which encourages families to sit down together for meals. Why is that important? A. Gathering around food to talk about the day&apos;s highs and lows helps my family stay connected. Since my schedule includes late nights, I cook and eat breakfast with my boys every morning and try to be home almost every night for dinner. Those are truly the best parts of my day. Q. Does your family have a favorite meal? A. There are several dishes we eat almost every week. One is some kind of pasta, whether we make it by hand or from a box. [See his recipe for Linguine Cacio e Pepe below.] Thursday is always fish taco night. And one night a week we order from [my restaurant] Otto. Each son orders the pizza named after him. The Benno is made with pesto and mozzarella, and the Leo is made with pork cheek, chickpeas, tomato, and cheese. A. My wife makes my birthday cake every year: an orange sunshine cake with buttercream frosting and mandarin oranges. That's it. Otherwise, she leaves the cooking to me. Q. And what do the Batalis like do together? A. We're active and full of energy so I love playing sports with them. On weekends I take my boys to baseball practice, then go to a ball field for kickball or basketball, after which we stuff our faces. Q. Are you a competitive family? A. When it comes to video games, including Rock Band, I'm the third best in the family, after my sons. I can still beat them at golf, but not for much longer: Leo hit a 129-yard hole in one last summer and Benno can hit a ball 285 yards off the tee, which is 20 yards more than me! That's both embarrassing for me and delightful. Q. You have a ton of famous friends. Who scores the most cool points with your kids? A. Bono, Michael Stipe, and Jimmy Fallon. They've all been to our house for dinner. When Bono roughhouses with the boys in the hall and plays football, suddenly Dad's cool. Because let's face it, I'm a chef. I'm never going to be a rock star. Culinary claim to fame: He co-owns 15 restaurants and has written eight cookbooks. He has also starred on the Food Network's Iron Chef America. Like father, like sons: "People tell me my sons look like me, especially Leo. But they're better looking and funnier than I am. The truth is, I wish I were more like them." Favorite getaways: "We have a quiet vacation home in Michigan. I'll spend two months there over the summer without a cell phone or computer, golfing, swimming in the lake, and cooking for family and friends. It's heaven!" 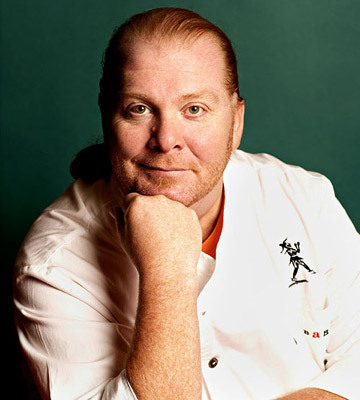 Batali book club: "My boys share my love of reading. When they were younger, we'd read Green Eggs and Ham and Goodnight Moon together. This summer we read All Quiet on the Western Front and This Boy's Life. When I wasn't looking, they grew up!" 1. Bring 6 quarts water to a boil in a large pot and add 3 tablespoons kosher salt (optional). 2. Add pepper to a 12- to 14-inch saute pan and toast over medium heat, stirring, until fragrant, about 20 seconds. 3. Add oil and butter and stir occasionally until the butter has melted. Remove from the heat. 4. Cook linguine al dente according to the package directions. Drain, reserving about 1/2 cup of the pasta cooking water. 5. Add 1/4 cup of the reserved pasta water to the oil and butter mixture, then add the linguine and stir. Toss over medium heat until the linguine is well coated. 6. Stir in the cheeses (add a splash or two more of the reserved pasta water if necessary to loosen the sauce) and serve immediately, with additional grated Parmigiano-Reggiano cheese on the side.